Drinking Water Water Tank Tnemec Company, Inc.
Online voting is now open for the 2018 Tank of the Year contest sponsored by Tnemec Company Inc., a provider of high-performance protective coatings. This marks the 13th year that Tnemec has recognized the aesthetic, creative and innovative uses of its coatings on water storage tanks. Voting will close Friday, Oct. 19, at 5 p.m. central time. Photos of all the nominated water tanks are posted on www.tankoftheyear.com, where visitors can vote for their favorite tank. Only one vote is allowed per person, but voters will be able to view the front-runners at any time when they revisit the site or track and share contest results using the hashtag #tankoftheyear. After online voting has ended, the water tank receiving the most votes will be named the People’s Choice and receive an automatic bid as a finalist for the 2018 Tank of the Year title. The People’s Choice winner and the 11 finalists selected by a committee will be announced on Oct. 22. The 2018 Tank of the Year will be announced on Oct. 26. 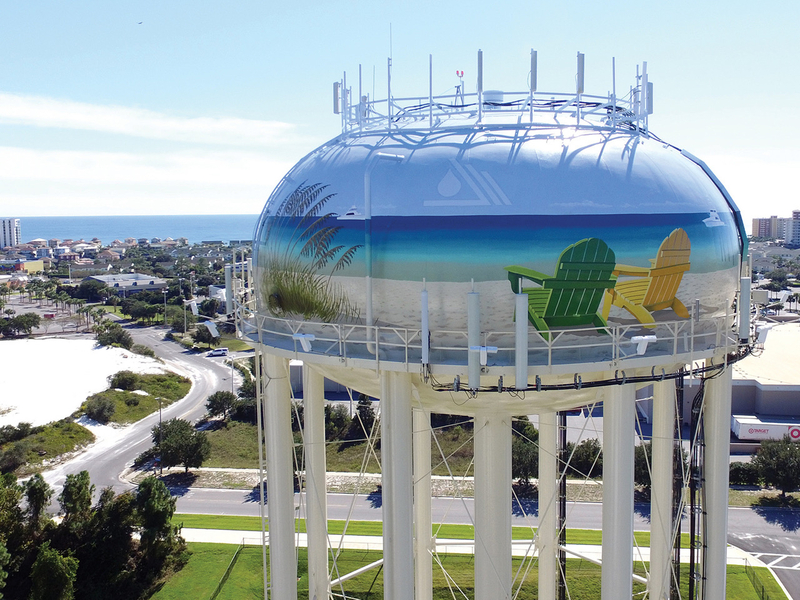 Last year’s winning entry in Destin, Florida, was a 500,000-gallon legged tank that featured a beach scene by muralist Eric Henn. The artwork shows two colorful beach chairs in the white sand, a stand of sea oats bending in the breeze and a fishing boat on the horizon. The design used an exterior coatings system from Tnemec, which included the fluoropolymer finish Series 700 HydroFlon for long-lasting UV light resistance and color and gloss retention.